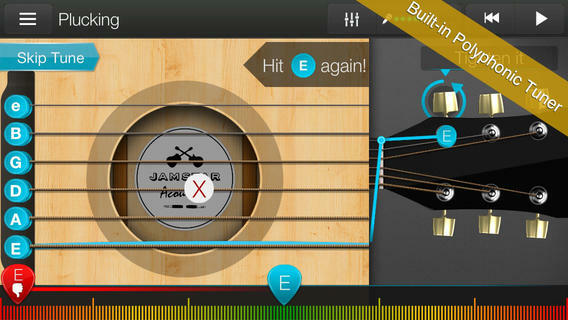 Jamstar Acoustics – Learn Guitar, developed by Live Tuen Ltd, is an interactive guitar application that works with any guitar. Its main focus is to teach you chords, scales, rhythm, and the most popular songs you know from your favorite musical artists. What makes Jamstar unique from other guitar apps is that it actually listens to your real guitar through the microphone and gives you real-time feedback. When you first launch the app you will have to sign up using your email or Facebook. This is a bit annoying as some people don’t want to give out their personal information. Hopefully the developers will allow you to use the application with out registering in the future. Once you are signed in you will be asked to choose your path based on how good of a guitar player you are. 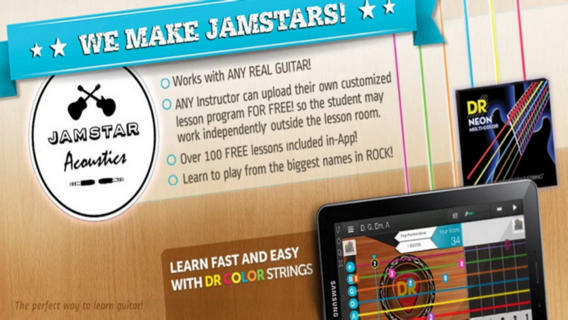 If you have never played guitar before, you will want to enter the Jamstar! course to get started. This will teach you the basics to help get you familiar with the guitar. If you are more advanced you can jump right into chords or melodies. When you start your first course you will be presented with a digital tuner that will help you tune your guitar string by string so that everything is on key. Once tuned you will launch your course and you can begin. Jamstar offers over 100 different courses for free and is a great learning tool for any guitar player who wants to advance their skills. 100 free courses is great to get started with, but if you want to unlock more such as certain songs or melodies, you will want to head over to their in-app purchases and grab all the bonus backs that they offer. Jamstar Acoustics is a FREE application in the Apple App Store and I would definitely check it out if you have any interest in becoming a better guitar player.